As rural Arizona towns go, Cave Creek is a perfect blend of past and present — part Wild West and part modern-day getaway destination. Cave Creek is located in the Sonoran Desert and boasts more than 5,500 residents, according to 2009 U.S. Census figures. The town is also in growth mode, largely in part to its proximity to Phoenix and Scottsdale, as well as to the availability of new homes in the area and a renowned local school system. Home sales in Cave Creek have been brisk in 2012, particularly in the more popular neighborhoods of Stagecoach Pass Estates, Sierra Vista, Estado De Cholla, Loringwood Estates, and Miramonte. Higher-end homes have also been in demand, particularly at Canyon Ridge Estates, where the average home price has been upward of $2 million, and at Willow Springs Estate, where plus or minus $1 million nets an upscale newer home. 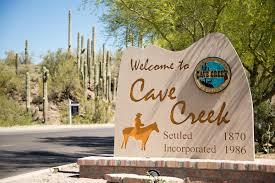 Cave Creek sits on about 28.2 square miles of land adjacent to its sister city Carefree and both towns share a view of the landmark Black Mountain. Rustic stage coaches — signs from the past — pop up throughout town. At the same time, Porsche's, BMW's, and shiny Harley Davidsons are not an uncommon sight in front of any local watering hole or eatery. A 2010 New York Times travel section articlepainted a picture of Cave Creek as being a place that people tend to find by accident — and then decide to stay. There are luxury hotels and upscale restaurants, but many people prefer to dine at the Buffalo Chip Saloon and Steakhouse, where there are cowboy boots hanging from the ceiling, barbecue pits, live music and live bull riding two nights a week. Cave Creek has more than twenty restaurants that range in cuisine from fine dining to cowboy chuck wagon. There is ample horseback riding, rodeos and country-western dancing. This being a relic of the old west, there is a local museumand people line up to go on a tour of the old mines. Many more people enjoy the Cave Creek Regional Park, the natural scenery of Spur Cross Ranchconservation area, and outdoor life via hiking or biking. With their close proximity, sister cities Cave Creek and Carefree share a local Chamber of Commerce, and a lot of the same customers. There is a Safeway and a Fry's Food Store in Cave Creek, as well as other local grocers like the Cave Creek Market or Bashas' (in Carefree) where a person might find more locally grown or homemade foods. Those looking to decorate their homes and clothing with a western motif need only turn to Big Bronco – Western Furniture— where everything from furniture, clothing, books and unusual knick-knacks are sold. Boutique shops like Flair, located in the Tuscany Village Shopping Center, feature a mix of clothing and gifts. Those in the know find their way to The Town Dump, which has been in business for more than 30 years and where shoppers find everything from furniture and lamps to cactus, ornate ironwork, bookshelves, bedframes, giant carvings, deer, moose and other animals, plus an ever-changing inventory. It is a bit like a giant flea market, but is open seven days a week and is part of the charm and originality of Cave Creek. For an actual flea market, folks come from far and wide to check out the monthly Cave Creek Thieves Marketon the first Saturday, where deals can be had, as well as gourmet foods from some of the areas' finest Gourmet Food Trucks. Admission is $1. Dining choices in Cave Creek include more upscale fare at Binkley's Restaurantand the Tonto Bar and Grillto the more casual and family friendly Cave Creek Smokehouse and Pour House Patioand Barros Pizza. There are Mexican Restaurants and Indian Restaurants, and some of the most popular foods in town are western-themed with Barbecue. The Horny Toad Restaurantis known for its Fried Chicken, plentiful Steak dinners and desserts. Harold's Cave Creek Corralhas bragging rights on Steaks, Ribs, Seafood and Chicken. For "the best Mexican food in the Valley" El Encantois the place to go. And of course, the Buffalo Chip Saloon and Steakhouse, which has a regular menu for lovers of meat that includes Buffalo Stew & Biscuits, and steaks and burgers, and a separate menu with Mexican food for those that crave food from south of the border. The 2,229 acre Cave Creek Regional Parkis an oasis on the Sonoran desert that rises in elevation from 2,000 feet to 3,060 feet. Hiking and camping are popular activities and in 2011, the park began contracting with an outside vendor to provide family friendly guided trail rides. Another company, Arizona Horseback Rides, offers guided trail rides through all Maricopa County Parks and into downtown Cave Creek. Cave Creek is also home to 2,154 acres of land that will forever remain open space thanks to the Desert Foothills Land Trust, which includes the 26.6 acre "Jewel of the Creek Preserve". The Spur Cross Ranch Conservation Areais Maricopa County's newest park. The park contains fascinating archeological sites and riparian corridors along Cave Creek, which flow in the winter months. It is a wildflower lover's paradise in the spring, and the area's lush vegetation provides a rich habitat for an enormous amount of wildlife. The park also used to be a mining and ranching area, and tours of the old sites are a popular draw. Residents of Cave Creek pay $1 for an annual pass that allows them unlimited access to the Spur Cross area. As a rural community, people come to Cave Creek for the slower pace and getting away from city life. Cave Creek is far enough away from Phoenix to be in a different world, yet close enough to take advantage of events and occasions. However, with the sun shining more than 300 days a year, there are some that find reasons to stay local and take advantage of the popular local activities. Residents savor annual events like the Cave Creek Pro Rodeo, which takes place in April as part of the town's Fiesta Days celebration. A memorial golf tournament and local fundraiserhas become part of the festivities over the past few years. Other events like Taste of Cave Creek, where attendees sample dishes and specialties from 20 area restaurants, make foodies out of even the novice cook. The two-day event each October includes screenings of entries from the annual Desert Hills Film Festival. The Stagecoach Village Fine Arts and Wine Festival, also in October, blend two days of Art, Food, Wine and Entertainment. Not to be outdone, Cave Creek Wild West Daysin November offer entertainment and relaxation for locals and visitors. The Town of Cave Creek has also embarked on a "Green" program that is moving the town toward energy independence while also saving residents and businesses money in the process. The "Save-A-Watt"program launched in 2011 provides residents with a Home Energy Check-up at greatly reduced rates and offers rebates to people that upgrade their homes to a more energy-efficient operationwith a goal of decreasing electric usage by ten percent in the town. Save-A-Watt works in conjunction with APS, an electrical power utility company that services the Phoenix metropolitan area. Cave Creek also offers homeowners a water audit, and encourages water conservationthrough using gray water (leftover water from sinks and bathtubs) for watering gardens and harvesting rainwater during the winter months when it is wet. Cave Creek gets an average of 13 inches of rain per year, usually followed by dry spells. The Cave Creek Unified School Districtservices students from Cave Creek, providing P-K through Grade 12 learning. There are five elementary schools within the district and two junior high schools and a bus schedule that takes students to and from. Cactus Shadows High Schoolserves grades 9-12 and has membership in the respected International Baccalaureate Program, giving the school access to an assortment of international educational programs. Cactus Shadows High School is one of the few public high schools in Arizona to receive a distinguished Great Schools rating of 9 out of 10. CCUSD consistently scores in the highest range and has had numerous highly performing and excelling achievement designations from the Arizona Department of Education. Schools within the district also provide popular sports and after school activities. There are numerous medical professionals in Cave Creek, many of whom operate their own private practice. Some doctors work out of facilities like the Dynamite Creek Medical Center, which is part of the regional John C. Lincoln Health Network. Hospital services are nearby in Phoenix and Scottsdale. Pet owners can be confident that their pet will get prompt veterinary attention 24/7 at the Animal Health Services Surgical and Diagnostic Center, one of several veterinarians within city limits. The Valley Metro public transportation system does not provide public transportation to Cave Creek. The private Arizona Shuttleis available for charter services, such as taking a large group to a sporting event or special occasion throughout the state, as well as some package delivery. To work with a team experienced with listing and selling Cave Creek Residential Real Estate contact Tony & Suzanne today!